I am a teacher librarian in California. And in todays' budget climate I still have my job. For that I am thankful. One aspect of my job that I don't love is convincing people of the importance of Libraries (school libraries in particular) and credentialed Teacher Librarians. I know that I am preaching to the choir; you are all book lovers and therefore, probably Library supporters. Last October I participated in the Dewey 24-hour Read-A-Thon. 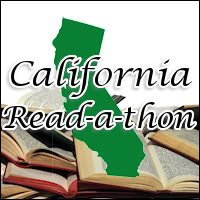 I thoroughly enjoyed myself and got a wild idea: I'd host a California Read-A-Thon for school libraries throughout the state. We'd get kids reading, I'd sponsor mini-challenges (yes, stealing most of my ideas from Dewey), I'd get prizes from publishers, it'd be so great! Now it's mid-March and I am in a panic! What was I thinking taking on this task? What if no one does it (we've only got 8 schools signed up so far)? Part of the problem is that a large percentage of California schools don't have credentialed Teacher Librarians and the Library Techs probably don't want to take this on. But, I am working on PR, getting prizes, and creating mini-challenges (for the Librarians).